If you are staying along Playa Blanca or in Barra de Potosi and get an urge to see the resort towns of Zihuatanejo or Ixtapa, it is an easy trip. Zihuatanejo has become a mid-sized city wrapped around a beautiful bay. Ixtapa is a government planned high-rise resort along the lines of Cabo San Lucas and Cancun, although it has not attained the size of those mega resorts. It has two excellent 18 hole golf courses and it is easy to make a day trip from Playa Blanca and play a round. There is a taxi stand in the village where you can have a taxi take you directly. The trip takes around 30 minutes. For those with a stronger taste for adventure and more patience, you can take public transportation. The voyage involves a combination of bus, minivans and riding in the back of a “pasajero” which is a pickup truck converted with benches and an awning. It is an authentic way to travel and for many people it is a highlight of their trip to Mexico. Figure about an hour and a half one way. The buses, vans and pasajeros run non-stop until about dark. There are good directions here. If you are staying in Zihuatanejo or Ixtapa and develop an itch for an adventure, it is easy to take a day trip to Playa Blanca. 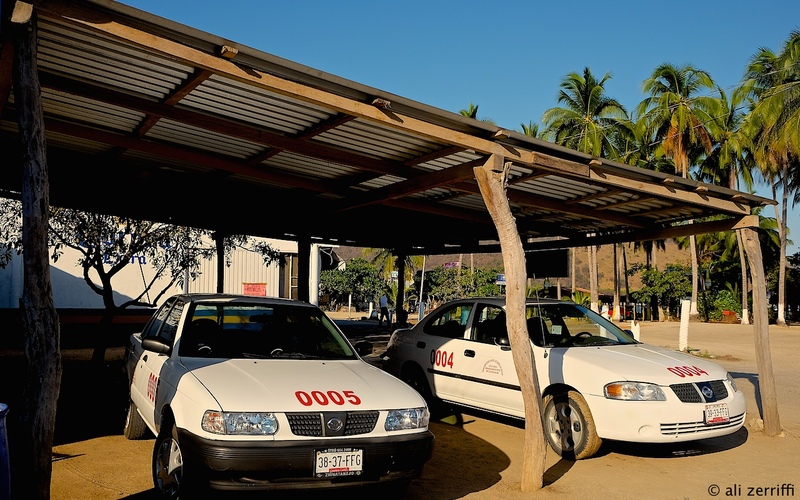 Your hotel can arrange for a private taxi or may offer a tour that includes the La Chole archeological site and a tour of the Potosi Lagoon capped off with lunch at one of the seafront enramadas in Barra de Potosi. The taxi stand in Barra has cabs that will take you back to your hotel. By car, the trip takes about 30 minutes.